The new flood-lit Eastern Leisure Centre 3G football pitch is a synthetic all-weather surface which allows play to continue all-year round. The project has been delivered under the Neighbourhood Renewal Schemes (NRS) programme and has been implemented in partnership with GLL, operators of the Eastern Leisure Centre. 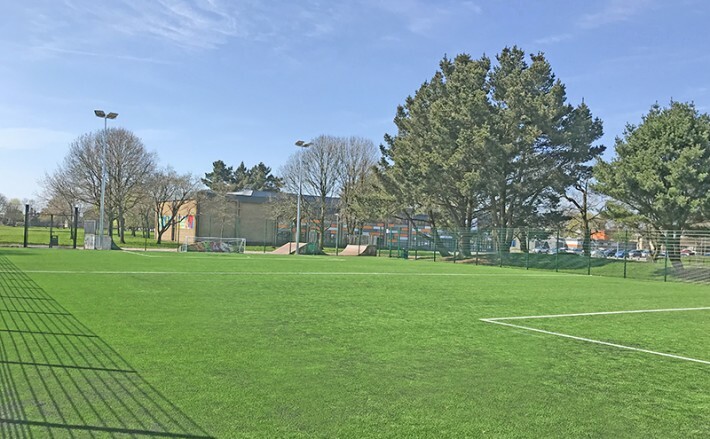 The project was put forward by Llanrumney councillors who identified a community need for better local sports facilities and suggested upgrading the run-down multi-use games area at Eastern Leisure Centre to create a modern 3G football pitch. Local councillors also raised concerns regarding safety to local residents walking from the 3G pitch to Newport Road. Therefore, 3 new lighting columns have been installed to provide some much needed lighting to the pathway and creating a sense of security for walkers after dark. The bins and benches in the vicinity have also been replaced due to their poor state of repair. The pitch was opened in time for the Easter Break and has been positively received. GLL will manage the facility, including ‘free-use’ time slots for local football clubs. This will benefit hundreds of children and local sports clubs every year. The opening event was attended by Sports Cardiff and children from Willowbrook Primary School, who demonstrated their footballing skills.